Well, that didn’t take long. Yesterday, China’s longest running bitcoin exchange, BTC China, announced it will suspend its local trading service at the end of this month, and today the country’s two other major exchanges — Huobi and OKCoin — followed suit to say they will cease at the end of October. The writing was on the wall when The Wall Street Journal reported on Monday that the Chinese government intended to shut down bitcoin exchanges after banning ICOs the previous week. Government officials then began meeting with exchanges this week to bring about the trading suspensions, a source with knowledge of discussions told TechCrunch. While the exchanges will no longer be allowed to facilitate the buying of crypto coins using Chinese Yuan and the trading of coins, they will continue to operate international-facing exchanges and other associated services. Smaller exchanges, however, will be closing for good. Those include Yunbi, which announced in Chinese it will shut up shop on September 20. 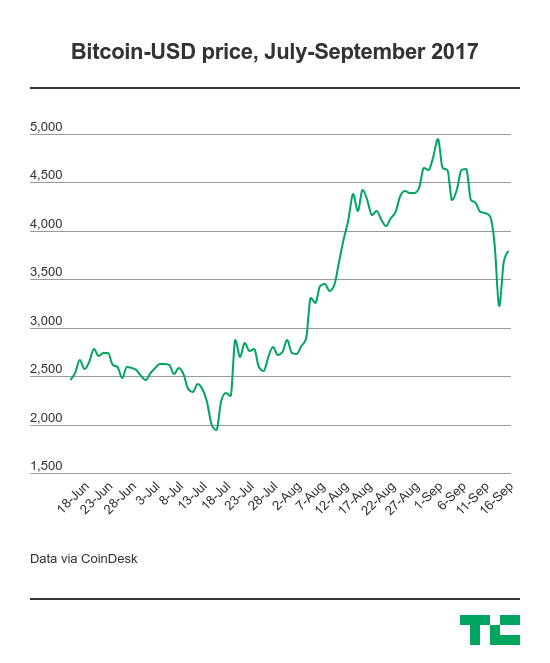 The impact of the crackdown sent bitcoin prices falling — with the crypto currency dropping below $3,000 on some exchanges for the first time in a month — but it quickly rebounded and, at the time of writing, it had nearly made up the losses. As with all things bitcoin, it is difficult to be sure exactly why, but there are plenty of reasons. Most importantly, China is no longer the dominant in bitcoin trader it once was. A series of government bans — most recently a four-month trading freeze due to security concerns — have seen its share of global trading drop from more than 90 percent in previous years to just over 10 percent today. Markets like Japan, Korea and the U.S. have emerged to account for the lion’s share of global trading volumes, so the impact of this China ban is not as severe as it initially may seem.